When I lived at home Christmas dinner of my memories was always set on a lace cloth with the best dishes and mom's wedding stemmed glasses. I broke one when I was 19 trying to show off to a boyfriend. I don't know how mom stood raising four kids mostly on her own. Looking back I have a better understanding of her frustration, anger, fears. She worked so hard, so many hours every day to keep us fed, to keep the house clean, no dishwasher no automatic washer/dryer. Gardening, preserving, sewing, working outside the home, having several boarders to help make ends meet. It was tough on the kids because they couldn't see the big picture. It was hard on the parents, constant work, small rewards. But, we were loved and knew it. I digressed. Always cranberry juice and gingerale in the wine goblets. Turkey, mashed pototoes, sweet potatoes, peas, carrots, pickles, green olives, gravy and dressing, pumpkin pies and ice cream. Still have same with my own family. Forgot the Christmas crackers and cloth napkins. 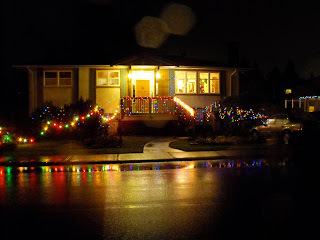 Picture from 2008 Christmas decorations.